Imagine walking into a room and heads start to turn. Nobody will know it's not solid - we won't tell if you won't! Why? We use REAL RHODIUM over semi-precious metals. Rhodium is used to make WHITE GOLD. Designed with the look and feel of solid gold we offer it at a fraction of the cost. Ends are soldered and we use the superior lobster clasps for strength. No more fiddling with clasps that break! Our 7mm Ropes come in sizes 16"-36". Other sizes available on request. We design our jewelry to last a lifetime and back it up with our guarantee which means that any time your jewelry breaks, tarnishes, etc., we will replace it for FREE. Yes, that's FOR THE REST OF YOUR LIFE! Our customer service is the BEST because we take personal care of you. We feel you should be treated the way we would like to be treated (and we like to be treated like Royalty). But don't take our word for it - read our reviews! Travel can be dangerous with valuables. Our jewelry is a perfect solution as replacing it is easier than replacing your priceless valuables. We get our raw ingredients from overseas (gold, jeweler's bronze, stones, etc.) Then we craft it into Lifetime Jewelry using our special formula. The results are a stunning product made in America which we are very proud of. Prices for materials are increasing all the time. Because of the internet we are still able to offer it at low prices but ONLY FOR A LIMITED TIME. We can't promise these will always be in stock and offered at this low price. CLICK "ADD TO CART" NOW! LOOKING FOR THAT SPECIAL GIFT? Look no more. 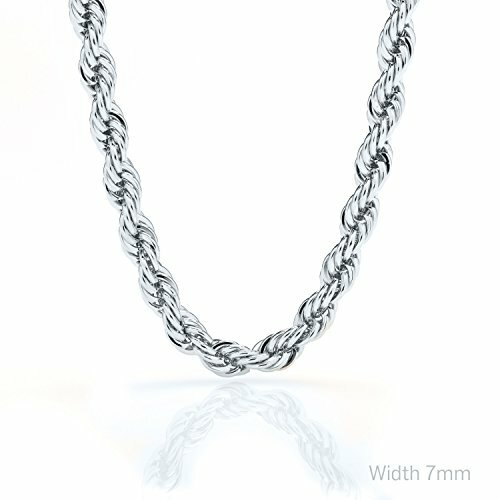 This beautiful Lifetime Jewelry 7MM White Gold (Rhodium Overlay) Rope Chain is perfect! Comes in a box or pouch for easy gift giving. Get it now at this seasonal discount price while supplies last. YES, YOU CAN BUY AN EXPENSIVE 18K GOLD CHAIN, but that's an investment. Gold coin would be a better investment, since you're saving on overhead for craftsmanship, brand name and middlemen. Would you wear your expensive gold chain anywhere at anytime? Not likely. If you did, It could be life threatening in some situations. So what's the point of owning a chain if you can't wear it? WE ARE A FAMILY RUN BUSINESS. We are real people who use our own products every day. We expect the best for our families and want the same for yours. We cut no corners in our products, and will cut no corners in our support to you. Model: Rope 7mm - 30"
Part Number: Rope 7mm - 30"
MPN: Rope 7mm - 30"